I know that someone already used this cartoon, and that I also spoke about it during class, but i think that it helps to make a point that I happen to feel quite strongly about…. Much the same as what people have become increasingly afraid might today if the Federal Government becomes too involved in economic affairs by ‘over-regulating’ big business and the economy as a whole, this cartoon implies that some of the steps taken by FDR in the New Deal may have come dangerously close to a socialist state. Most notably, the National Recovery Administration (NRA) that was created to promote cooperation between big business and the government by implicating codes to regulate output, prices, and work conditions. Through the NRA, Roosevelt “Had repudiated the older idea of liberty based on the idea that the best way to encourage economic activity and ensure a fair distribution of wealth was to allow market competition to operate unrestrained by the government.” – pretty much a survival of the fittest type of situation. I think that President Grover Cleveland’s the idea that “The government should not support the people” and that, “Federal aid… weakens the sturdiness of our national character” speaks volumes about what true capitalism, for better or for worse, is really about. Actually, I believe quite strongly that many of the policies enacted by the New Deal are, today more than ever, serving as a crutch for the weak and lazy (for lack of a better term). Don’t get me wrong, I do understand that we might not all have what it takes to become billionaires, and that much of it can sometimes be out of our hands, but things like social security, and welfare – which were created to help a devastated population during the Great Depression – seem to actually be hurting more than they’re helping by “weakening the sturdiness of not only our national cgaracter, but more importantly our character as individuals… And that’s why I decided to expound on the point that I made during class earlier today. Sewer Socialism is a term described the American socialist movement that centered in Milwaukee Wisconsin. With the creation of the Socialist Party of America, this group deemphased social theory and revolutionary rhetoric and in favor of honest government and efforts to improve public health. The Sewer Socialists fought to clean up what they saw as “the dirty and polluted legacy of the Industrial Revolution,” cleaning up neighborhoods and factories with new sanitation systems, city-owned water and power systems, and improved education. In 1910, the Socialists won most of the seats in the Milwaukee city council and county board. 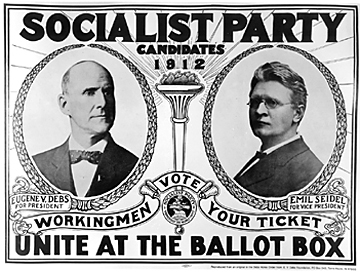 This included the first Socialist mayor in the United States, Emil Seidel, who also received the nomination for Vice-President on the Socialist Party ticket in the 1912 election with Eugene Debs. This movement ended in 1960 when Frank P. Zeidler left his office as Milwaukee mayor.